MoTeC engine management and data acquisition systems are designed for performance, reliability and versatility. With advanced technology and a multitude of expansion options, our products can be configured to suit almost any application—on land, water and even in the air. Every level is catered for, from high performance road vehicles and amateur motorsport to top class professional race teams. MoTeC's ever expanding product range is extensive and modular, allowing customers to tailor a solution to their individual needs. A core range of fully programmable ECUs, data loggers and displays can be integrated with peripheral devices and accessories to form a complete solution that powers, controls, logs, monitors and communicates virtually any automotive parameter. 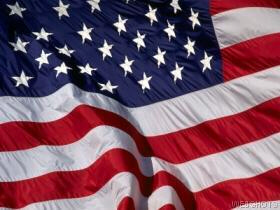 CLICK on an area of interest to begin. In its most basic form an ECU monitors the engine through sensors and uses this information to determine the quantity of fuel to inject and the timing of the ignition depending on engine speed (RPM) and engine load conditions. Typically, an ECU will use throttle position, manifold absolute pressure (MAP) or mass air flow (MAF), or a combination of these to calculate the load conditions. 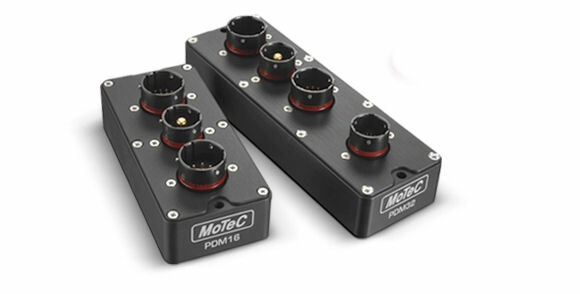 CLICK HERE for details on MoTec's eleven ECU models. A data acquisition system measures and records important vehicle parameters via sensors. These parameters can be analysed to gain insight into the behaviour of the engine, chassis and driver, which can ultimately result in greater predictability and better performance on race day. Over recent years, data acquisition systems have become powerful tools that are vital to success at all levels of motorsport. CLICK HERE for details on MoTeC's four data systems. 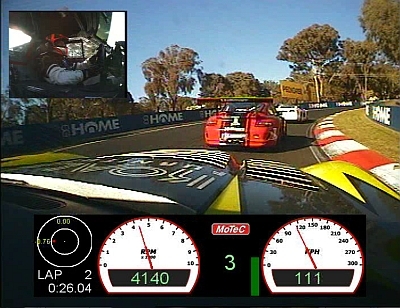 MoTeC’s Video Capture System (VCS) is an integrated in-car camera system, designed and built for race cars and harsh environments. The VCS records video and audio using the MPEG-2 video compression format at broadcast quality. It includes a built in real-time graphics processor that allows sensor data to be overlaid onto the video in real-time without the need for additional hardware. The CAN interface enables communication with other devices, for example to set Auto Start/Stop Recording conditions. The Video Capture System is supplied as a kit with either a 4 GB or a 16 GB high performance flash card. CLICK HERE for details on MoTec's video system. There are many advantages of using a single digital display, not least of which is the ability to customize screen layouts. MoTeC displays are designed for flexibility, allowing drivers to configure multiple 'pages' with the information they most want to see at any given time, for example during practice, qualifying and race. CLICK HERE for details on MoTeC's three dash displays. MoTeC Power Distribution Modules (PDM) are designed to replace conventional relays, fuses and circuit breakers by providing electronically switched power to the various electrical systems in the vehicle. This simplifies wiring and switch requirements, while increasing reliability. CLICK HERE for details on MoTeC's four PDM options. MoTeC supplies a range of centre differential controllers that can be configured to control the torque distribution by adjusting the percentage lock between front and rear differential -- the SDC (Subaru Diff Controller) and MDC (Mitsubishi Diff Controller). The SDC and MDC units quickly and easily replace the factory centre differential controllers with no wiring modifications needed. CLICK HERE for details on MoTeC's SDC and MDC units. The quick and easy to use Professional Lambda Meter (PLM) measures the air fuel ratio over a wide range of mixtures with fast response time. It has the power and configurability required for both development and tuning of emission controlled vehicles and for use in motorsport. CLICK HERE for details on MoTeC's PLM, LTC, and LTCD items. MoTeC systems are designed with a diverse worldwide customer base in mind and as such, they are well suited to customization and expansion. Here at Precision AutoResearch, we can provide a range of sensors, actuators and I/O expanders to create a complete solution with the most suitable components. CLICK HERE for details on MoTeC accessories.